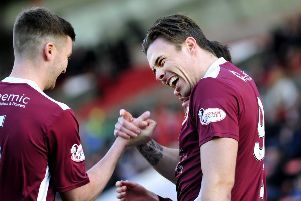 A spirited second half performance was not enough to spare Stenhousemuir from defeat at home to Raith Rovers. Early goals in each half from Daniel Armstrong and Callum Crane put the away side 2-0 up, and seemingly on their way to a comfortable victory. However, Stenny had other ideas, and after pulling one back through Mark McGuigan with over 20 minutes still left, there was genuine belief that the game could be salvaged. The home side pushed bodies forward, forcing Raith into panic mode, but a special strike from Armstrong, his second of the game, broke Stenny hearts and sealed the three points for the Kirkcaldy side. For caretaker Stenny boss Colin McMenamin, the outcome was disappointing. "The boys were excellent second half and really unlucky not to pick anything up," he said. "We put them under real pressure and they reverted to five at the back, but we weren't ruthless enough." Stenny then had a bright spell in the five minutes before half-time with three quick attempts on goal, none of which hit the target. The best opening fell to Ross County loanee Harry Paton after the Rovers defence failed to properly clear their lines, but with time to size up the goal from 18 yards, he blasted his effort too high. Rovers were glad of the half-time whistle to end the spell of home pressure, and John McGlynn's team talk seemed to get his players back on track, with Armstrong forcing Graeme Smith to push a 20-yard drive past the post shortly after the restart. Perhaps thinking they were home and dry, Raith seemed to lose concentration at the back as Stenny proceeded to create chance after chance. A ball over the top put McGuigan between the centre-halves, only for Robbie Thomson to come to the visitors' rescue with a point-blank block. Stenny got the goal their response deserved on 67 minutes when McGuigan broke clear again and this time he coolly lobbed Thomson to reduce the arrears. Rovers were now coming under pressure from a Stenny side working hard for their caretaker manager. Stenny saw a chance for an equaliser slip past when Kevin O'Hara was unmarked at the back post, but his ball back across goal was nodded wide by fellow sub Bobby Vaughan. McMenamin brought himself off the bench as the home side geared up for a late onslaught, but a wonder goal from Armstrong deflated their hopes. The Rovers winger took the ball at the corner edge of the box, looked up, and curled a fantastic effort over the arms of Smith into the top corner. Stenny will feel they deserved a point for their second half showing, but they paid the price for a slow start.